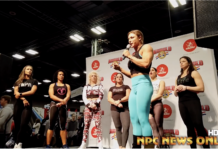 IFBB Fitness Pro Missy Terwilliger: Fitness Instruction. If you are competing in fitness, you are going to want to watch this video. Missy takes you through what it takes to be successful in the fitness division. How to choreograph your routine and the basics of fitness. Next articleREMEMBERING STEVE KARR: The National Physique Committee lost a great friend this week, Steve Karr, the Nevada district chairperson for 28 years.